Precious metals advanced for the first time in three sessions Wednesday, though only silver climbed for more than it lost in the past two days. Rebounding from a near two-month low, gold for December delivery settled up $34.60, or 2.7%, to $1,320.70 an ounce on the Comex division of the New York Mercantile Exchange. Prices ranged from a low of $1,276.90 to a high of $1,324.20. "Short covering, bargain hunting and safe-haven demand were featured," noted Jim Wyckoff, a senior analyst at Kitco Inc.
"Also benefiting all the precious metals Wednesday were key ‘outside markets’ that were in a bullish daily posture: solidly higher crude oil prices and a slump to an eight-month low in the U.S. dollar index." 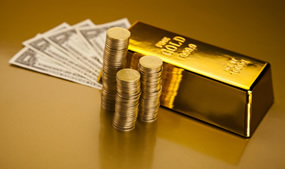 On Tuesday, gold dived $40.90, or 3.1%, to close at $1,286.10 an ounce, its lowest price since August 7. Silver led percentage gains among precious metals. Silver for December delivery rallied 72.2 cents, or 3.4%, to $21.90 an ounce, trading between $20.99 and $22.04. Prices in the prior session declined 53.3 cents, or 2.5%. January platinum gained $8.10, or 0.6%, to $1,393.40 an ounce, trading between $1,378.50 and $1,400.90. It lost $27.10, or 1.9%, in the prior session. Palladium for December delivery edged up $2.30, or 0.3%, to $721.20 an ounce, ranging from $712.10 to $722.60. Palladium on Tuesday fell $8.25, or 1.1%.